The Thrifty block was first published in 1939 by the Kansas City Star, according to Barbara Brackman’s Encyclopedia of Pieced Quilt Blocks. Was it was named for the economic times during the Great Depression or because it is easily made from small scraps, making it a thrifty block to construct in any era? 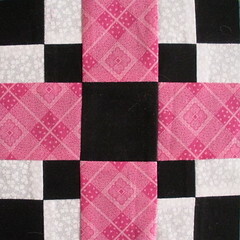 Directions for making a six inch block can be found here: Thrifty Quilt Block Pattern. PINK may be any pink tone-on-tone (TOT) print or any multi-color print that is predominantly pint and “reads as pink” if you are looking at it from across the room. The pink may be any shade of pink–light, medium or dark, soft or bright. Variation will be good within our scrappy pinks, but try to avoid straying into the peaches or reds. BLACK may be solid black or a black-on black (BOB) print. You may also use a black and white (B&W) print that is MORE BLACK than white for the black in this block. WHITE may be solid white or a white-on-white (WOW) print. You may also use a black & white (B&W) print that is MORE WHITE than black for the white in this block. If you are using Black and White solids or BOB and WOW, you may use the same black and whites in all your blocks. If you are using B&W prints, you may only use one in each block, for example, if you use a B&W for the Black, you can’t use another B&W for the white in your block. You can repeat B&W fabrics in multiple blocks as long as your fabric combinations are unique. Remember, links to the Block Lotto guidelines and FAQs are found at the top of the left sidebar and, as always, if you have any questions about fabrics, construction or joining the lotto, just ASK by posting a comment or emailing me. And yes, if you are lurking or have stumbled onto this blog from somewhere else, you CAN join us and we’d love to have you.